The statement has collected the signatures of 293 organizations from14 countries and the press conference was successfully held on October 19th at COP10. Advocacy advertising of the same meaning appears on International Herald Tribune (10.18). 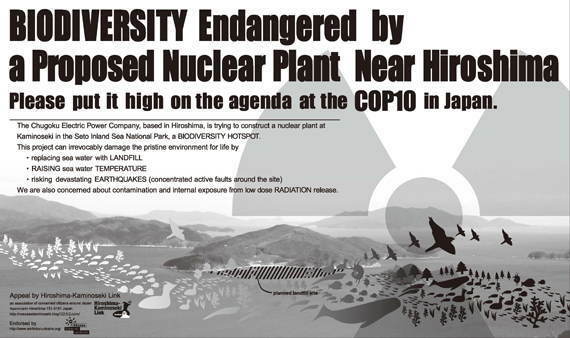 BIODIVERSITY is Endangered by a Proposed Nuclear Plant Near Hiroshima. Please put it high on the agenda at the COP10 in Japan. The Chugoku Electric Power Company, based in Hiroshima, is trying to construct a nuclear plant at Kaminoseki in the Seto Inland Sea National Park, a BIODIVERSITY HOTSPOT. We are also concerned about radioactive contamination and internal RADIATION exposure from low dose radiation release. We urge you to make Kaminoseki an issue in the conference, and put pressure on the Japanese government to take serious measures for protecting the biodiversity. Yokosuka affiliate Group of spreading the screen "Honey Bees buzz sound and revolving motion of the earth"
Wkayama City affiliate Wakayama Group screening "Honey Bees buzz sound and revolving motion of the earth"
"Stop construction of the Kaminoseki nuclear power plant!"